Lifelong learning is critical to success in HR and our members value professional development. Staying current in the field ensures that HR professionals remain at the top of their game to deliver strategic guidance to employers, clients, and customers. The Annual Conference is a fabulous way for HR practitioners across the state to get SHRM and HRCI credits without incurring a lot of travel expense. An effort this large requires lots of volunteer help to run smoothly! The Committee is responsible for planning and executing the one-day conference with the assistance of RSHRM staff. Committee members are expected to deliver a meaningful experience for our members, to meet assigned goals, and to remain within assigned budget. Publicity/Marketing: Develop theme for the conference. Help publicize this key RSHRM event by developing content for eblasts, webpage, flyers and coordinating RSHRM’s social media efforts. Where appropriate work with local media to get coverage for the event. 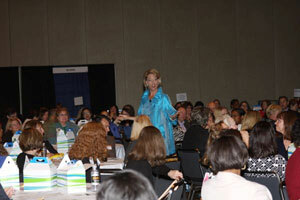 Speaker Solicitation, Selection, and Care: Find amazing keynote speakers. Solicit speaker RFPs. Review speaker RFPs to select concurrent session speakers. Along with RSHRM staff act as a liaison with assigned speakers to make arrangements for AV needs, travel needs, etc. Work with Board to assign those introducing speakers and suggest speaker gifts. Exhibitor/Sponsor Solicitation and Care: Assist RSHRM staff and other committees obtain sponsors/exhibitors for the conference. 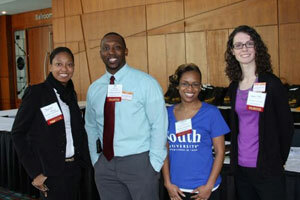 Assist staff in welcoming sponsors on day of the conference. Encourage attendees to visit the exhibitor booths. Help develop the ‘bingo card’ idea in keeping with the conference theme. Determine what the grand prize should be. Arrangements: Work with RSHRM staff to design exhibit hall in keeping with Conference theme. Help set up and take down, plan directional signage, plan registration process, food coordination, assist in managing the RSHRM booth in Exhibit hall for the day, assist photographer. Please complete the form below to volunteer for the Annual Conference Committee.